Green light laser surgery for the prostate refers to Photoselective Vaporization of the Prostate using a green light laser (also known as KTP laser). It is used in the treatment of Benign Prostatic Hyperplasia or more commonly known as enlargement of the prostate gland. Green light laser treatment is a minimally invasive therapy that evaporates prostate tissue which is blocking the flow of urine from the bladder. It uses a unique high power laser energy which is selectively absorbed by blood within the prostate tissue which leads to vaporization and removal of the tissue, leading to an open channel for passage of urine. 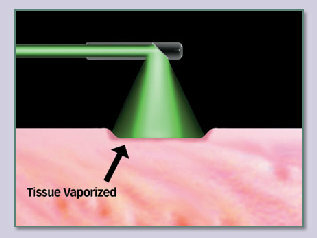 At the same time, the laser seals blood vessels beneath the area of vaporization which results in substantially less bleeding, compared to traditional traditional transurethral resection of prostate (TURP). There are much fewer side effects and recovery is much quicker. Is Green Light Laser treatment suitable for all patients? How is Green Light Laser treatment done? Following anesthesia, a scope will be passed via the urinary opening from external into the urethra, prostate and bladder. 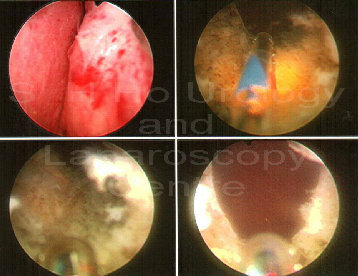 The green light laser fiber is introduced via the scope and treatment is commenced. No surgical incision or cut is required on the body. The treatment time is about 1-2 hours, depending on the size of the prostate. At the end of treatment, a small rubber tube called a catheter is replaces the scope. The tube drains urine directly from the bladder into a bag. What is to be expected after the Green Light procedure? This treatment is suitable for almost all patients with prostate enlargement who require surgery or not responding to medical (drugs) therapy. Prostate drugs are initially prescribed to patients with enlargement but some patients will progress and will require surgery. Surgery is also needed in patients who have complications such as bladder infection, bladder stone, inability to pass urine (retention) or kidney failure. As green light laser has the additional ability to control and decrease bleeding during surgery, it has advantage in patients who are taking blood thinning medications such as Aspirin or patients who are taking anti-coagulation drugs such as Warfarin. The catheter will be removed within 24 hours and normal urine passage resumes. The expected hospital stay is usually only one night. Small amount of blood may be seen in the urine and it will lighten to normal color within a few days. A person can return to work within 4-5 days.